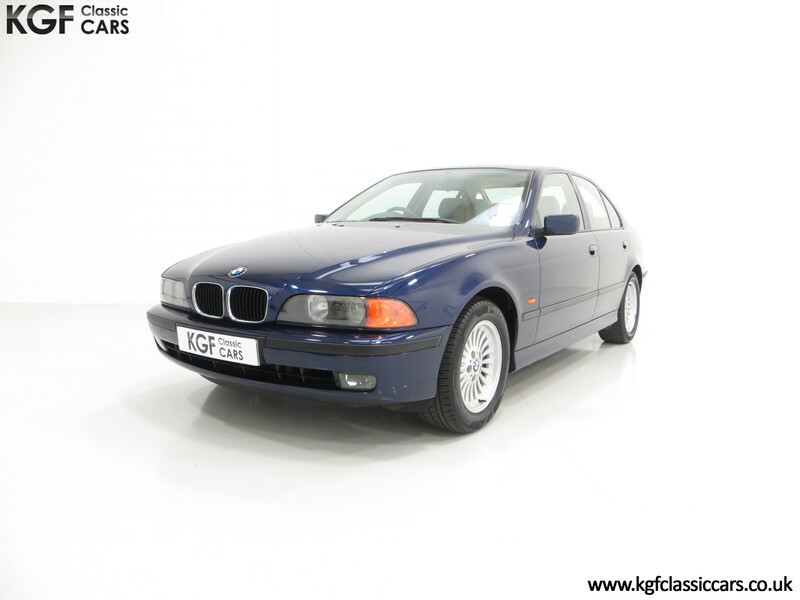 An outstanding BMW E39 523i SE with one owner and just 32,647 miles. 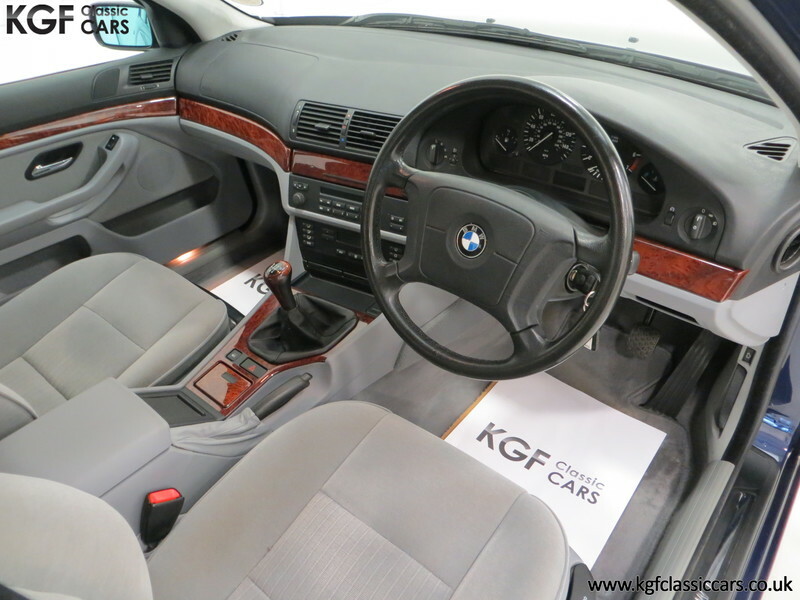 Automatic Stability Control + Traction (ASC + T), airbags for front seat occupants, predetermined deformation crumple zones, collision absorbent bumpers, BMW Business stereo system with “hide from view cover”, interior temperature dual zone climate control, first aid kit, toolkit, warning triangle, rechargeable torch. Special Equipment model; Automatic air conditioning, check control pictogram, interior light package, on-board computer. 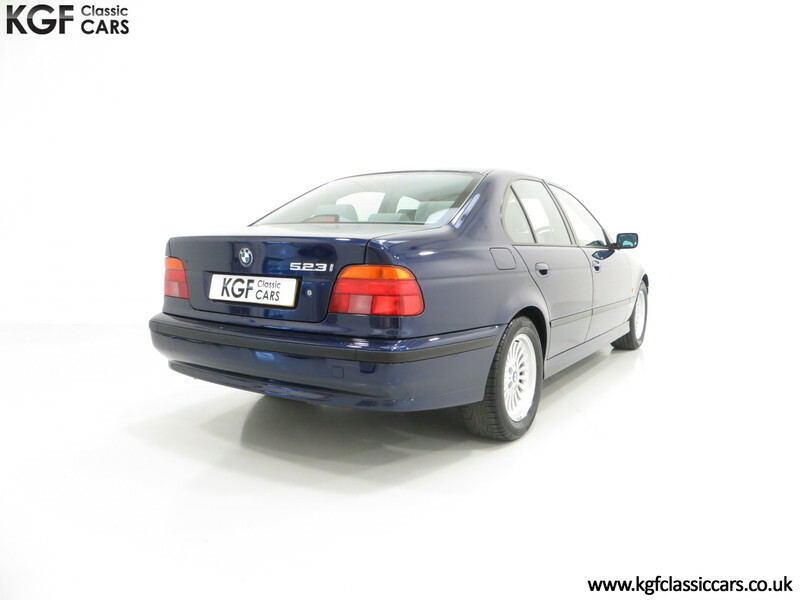 Factory options; Metallic paint, spoke style alloy wheels, de-chroming. Dealer options; velour foot mats. 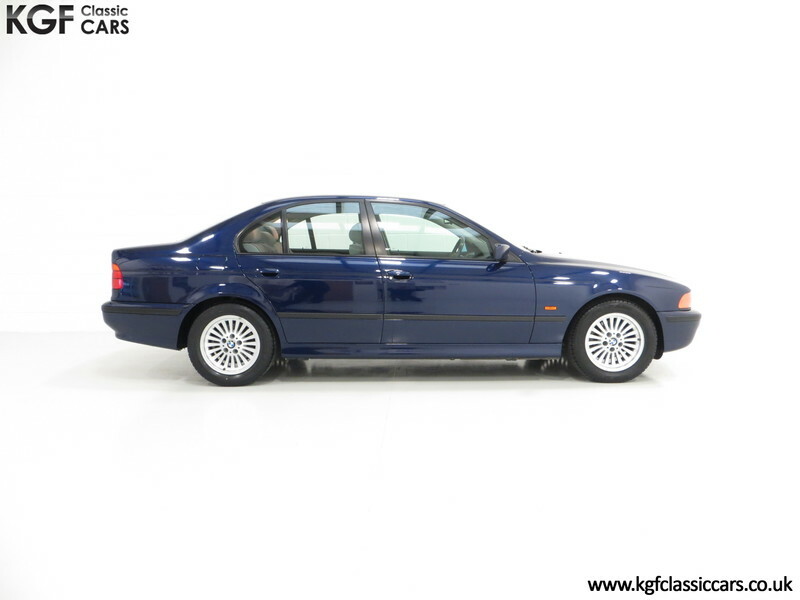 This beautifully preserved E39 523i SE was factory ordered in optional Montreal Blue Metallic, (Code 297), with the de-chroming option specified by the original and only owner. 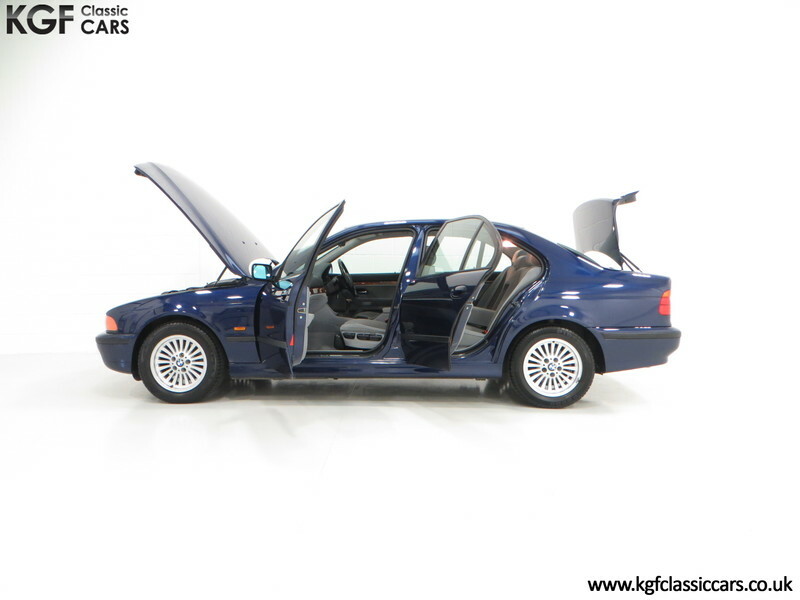 The stunning original paintwork is simply magnificent with a brilliant polished shine and uniform finish throughout. 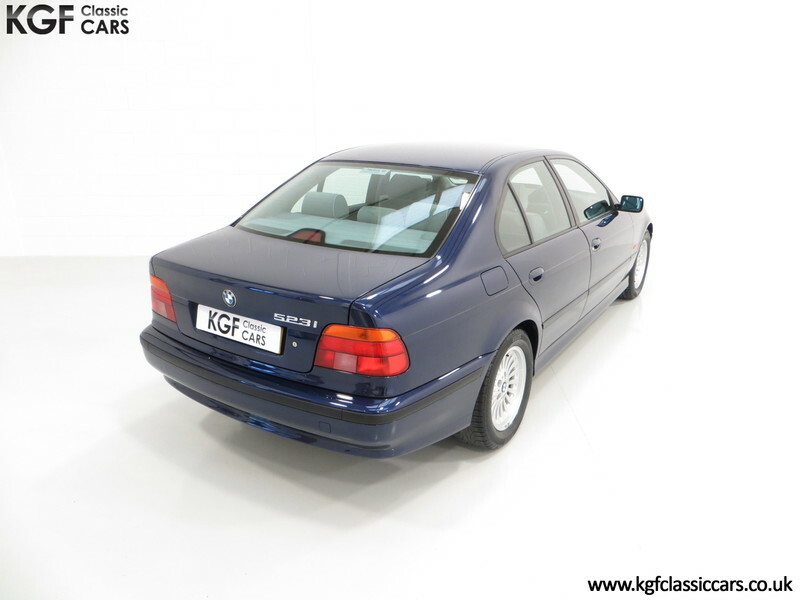 With absolutely no damage to the factory panels and only miniscule markings to the paintwork, this example has been preserved to an amazing standard and is entirely commensurate of the mere 32,647 miles covered. 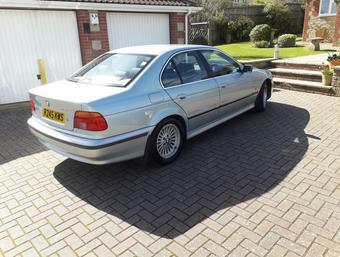 All trim pieces are fully intact as you would expect from this pampered, one owner, low mileage example, with only a light parking mark to the rear bumper visible. 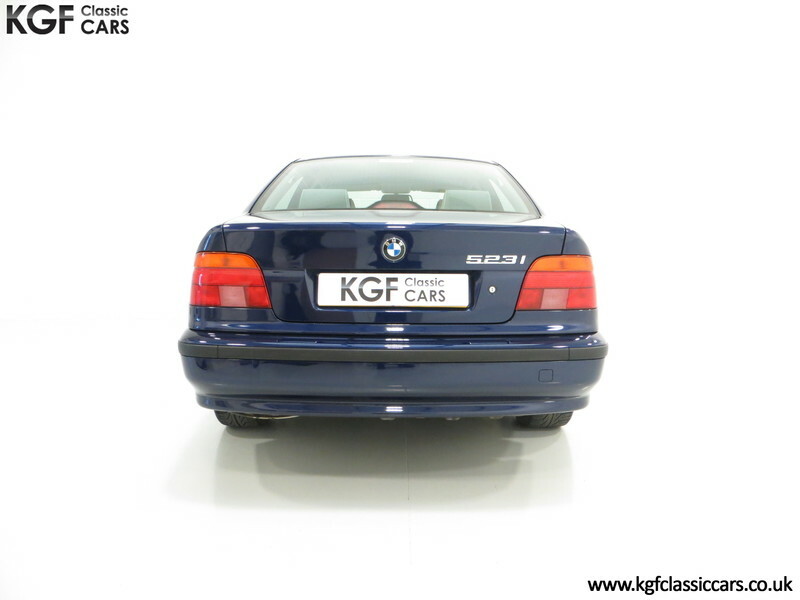 Supplying BMW main dealer number plates, rear screen sticker and tax disc holder remain fitted, a pleasing sight for originality seekers. 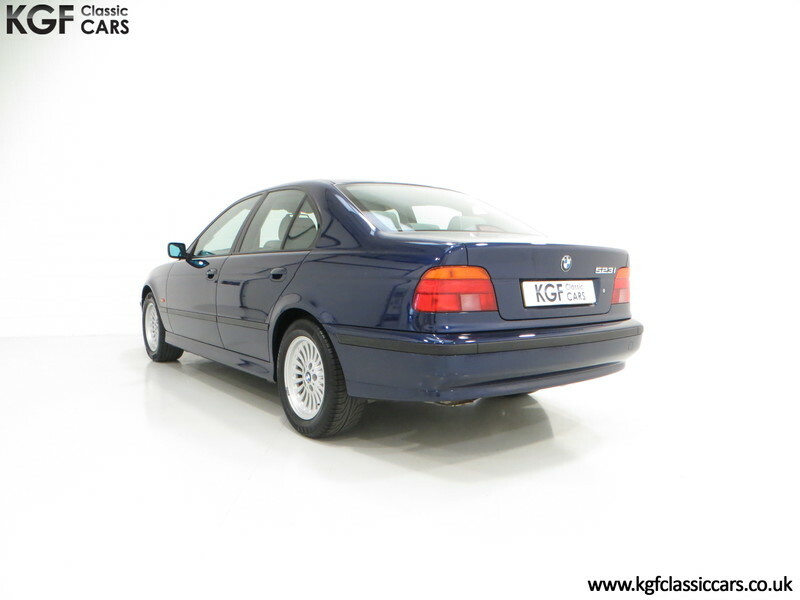 An absolute delight for any BMW enthusiast. 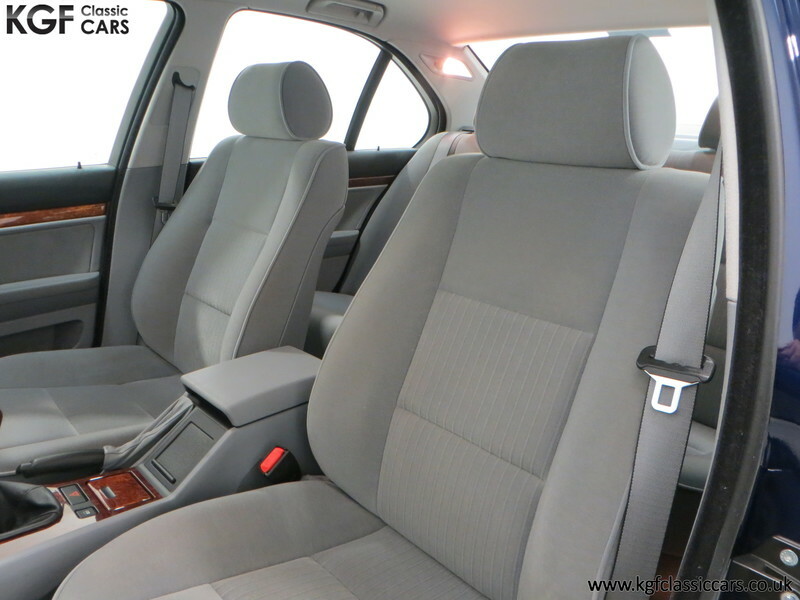 Soft luxurious Grey Cloth upholstery, (Code D3TT), covers the immensely comfortable and supportive multi-zone foam padded seats which remain in perfect condition, a standard upheld throughout the entire interior. 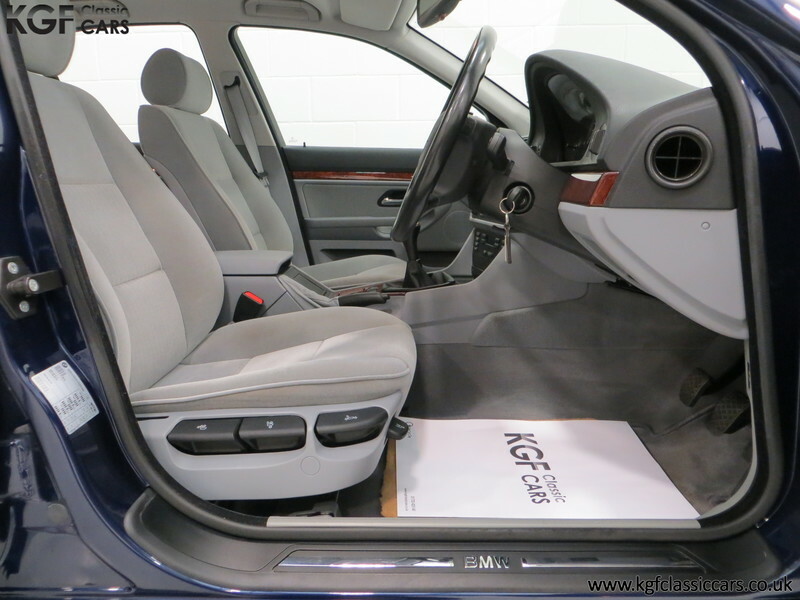 All seats are pristine with no wear, and the conscientious owner not only specified expensive velour foot mats from the dealer, he also covered these with thick carpet sections to protect them! 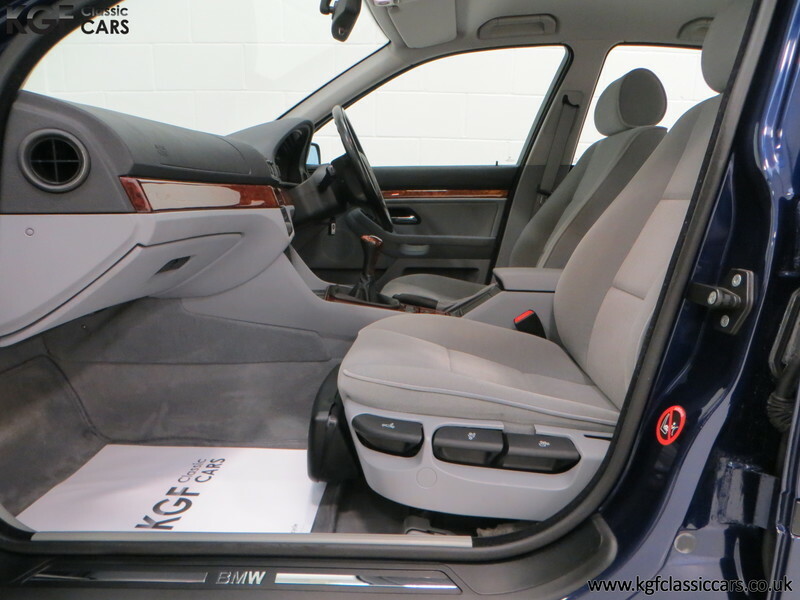 The headlining, door cards, walnut trim and dashboard are simply perfect, and absolutely all functions and controls including the ice-cold air-conditioning operate perfectly. 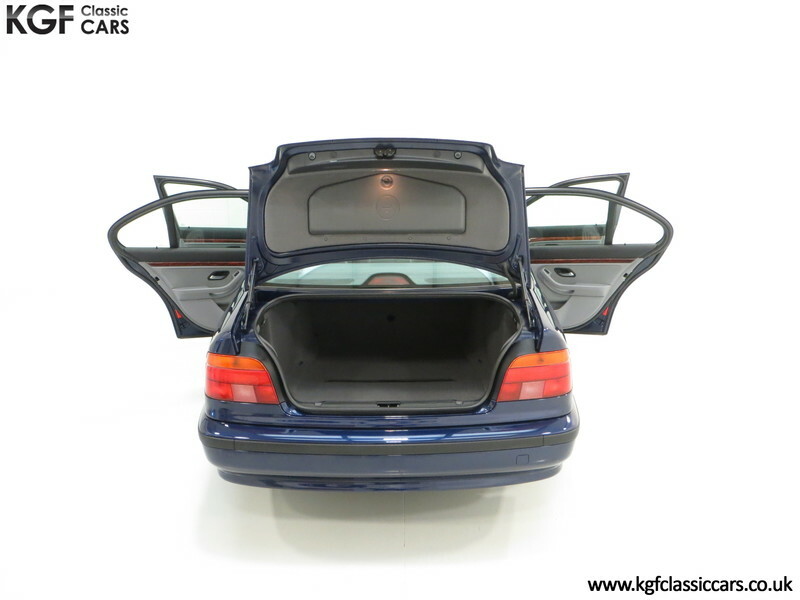 Such is the cossetted nature of this car, the first aid kit remains sealed and unused and the immaculate boot area boasts an entirely complete BMW toolkit with wheel changing/emergency equipment. 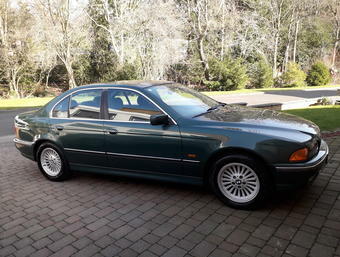 Very close to a new E39 interior and a real testament to the fastidious owner from new. The sublime straight 6-cylinder light alloy engine from BMW needs little introduction and has rightly earned legendary automotive acclaim. Performance figures from the 170bhp are quoted at 0-62mph in 8.5 seconds and a top speed of 142mph. 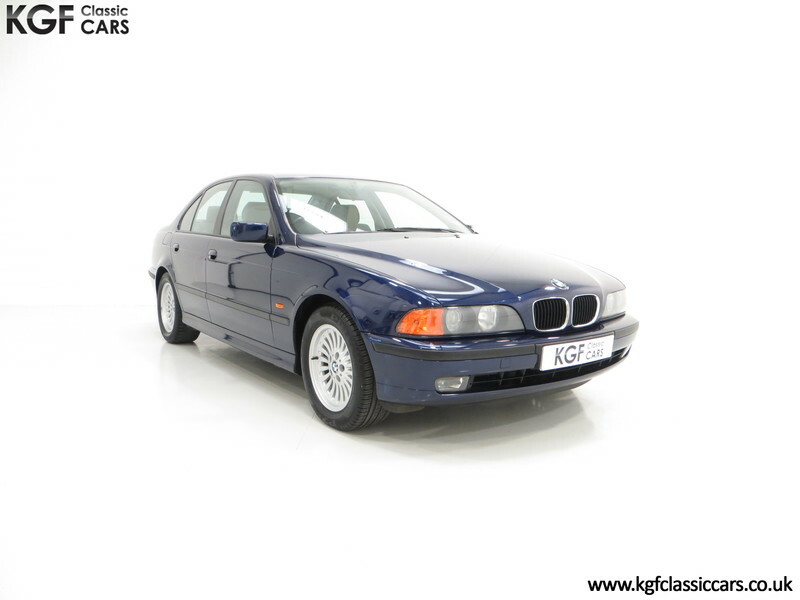 Having covered a mere 32,647 miles from new, this example performs impeccably with the unmistakable silky-smooth power delivery and delightful engine note. 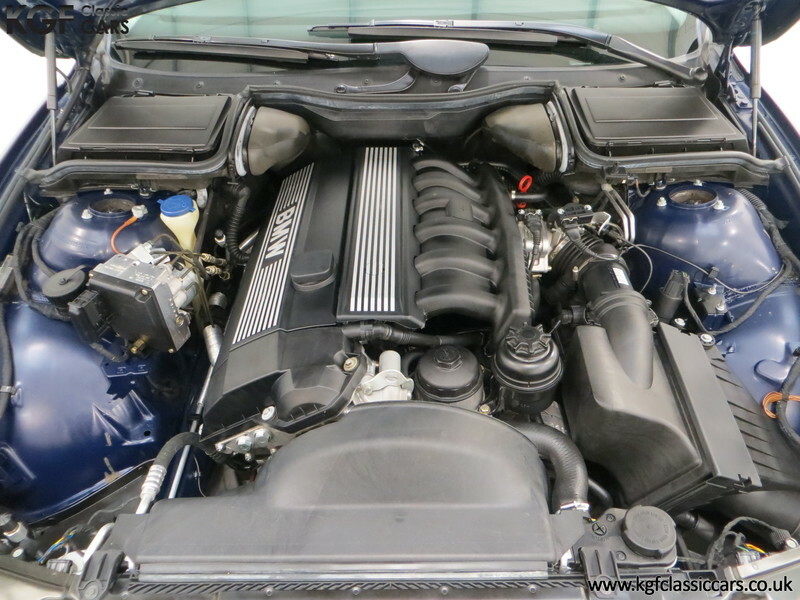 The engine bay is beautifully clean with PDI dabs still visible and factory plates and stickers intact including the bonnet underside colour code sticker. The five-speed manual transmission with Automatic Stability Control + Traction is light, direct and effortless. 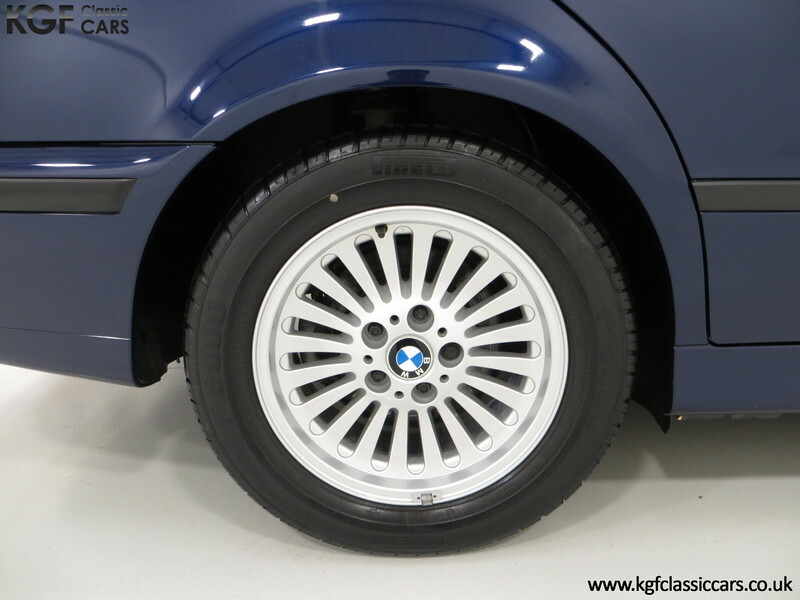 Factory optional and expensive 16in BMW Spoke-Style light alloy wheels are pristine and have the original BMW centre caps fitted. Premium brand matching Pirelli 225/55 R6 tyres have excellent tread remaining and the spare is still shod in the original Pirelli P6000 item. The high performance ABS assisted braking system is everything you would expect of this powerful driving machine. 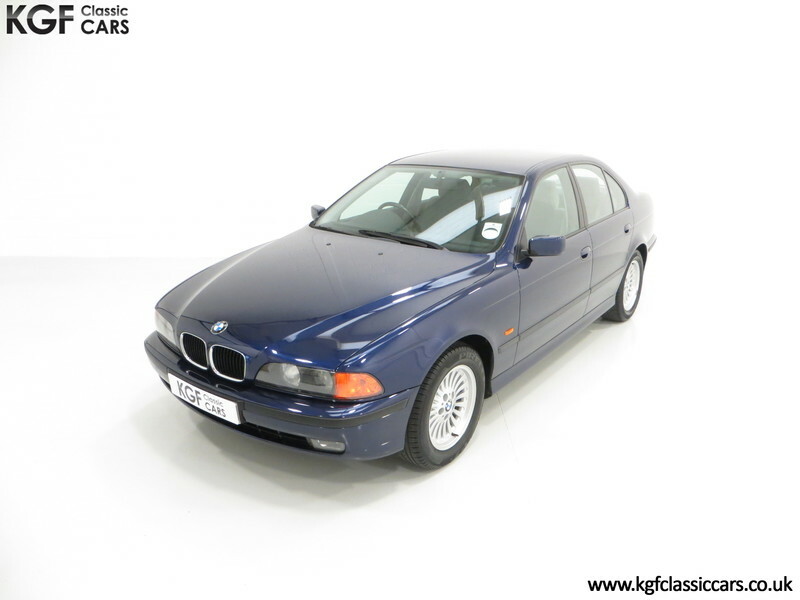 Supplied new by BMW Main Dealer, Taylors of Boston, first registration took place on 1st August 1996. The first and only owner, BMW enthusiast Mr Dennis Coxen, covered a mere 32,647 miles and the original V5 document lists zero former keepers. 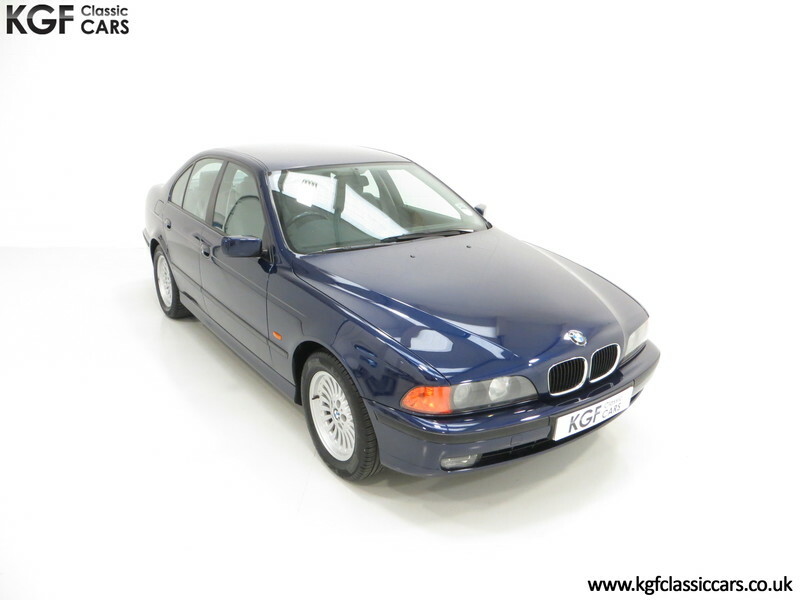 A new car sales invoice and factory specification print out confirms the price paid of £28,221 less a part exchange allowance of £14,000 for his BMW E34 525i SE. Subject to CBS, (Condition Based Servicing), the service book displays eight stamped entries, (five from the supplying Dealer), with the most recent being January 2019 at Sycamore BMW of Peterborough. 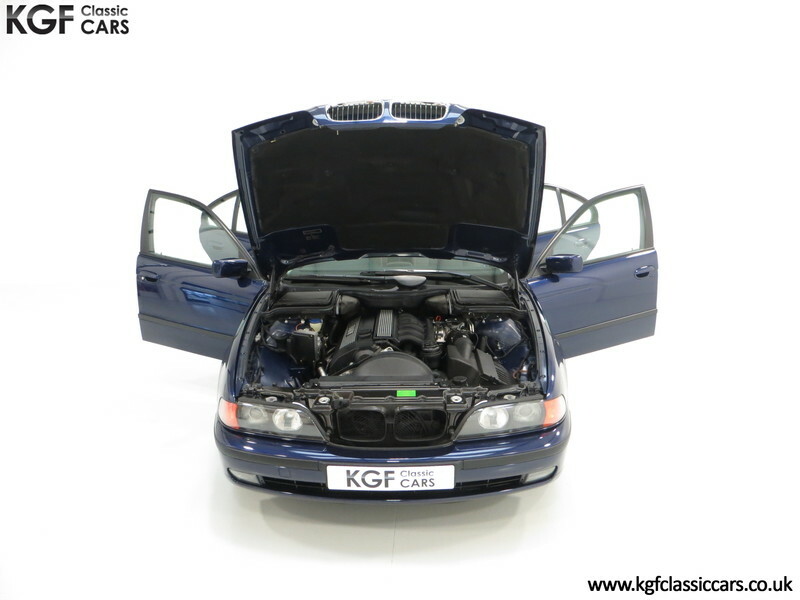 An insight into the fastidious owner is that he stipulated an oil and filter change on the running-in inspection despite not being a requirement by BMW! The A5 leather wallet also contains the dealer supplied book packs, manuals, user guides and point of sale literature. 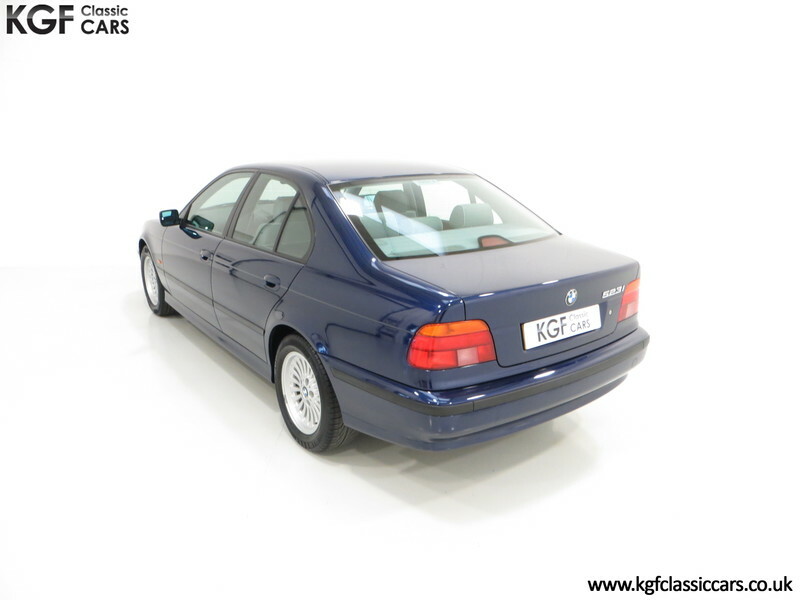 Two sets of remote keys and an original sales brochure and option pamphlet complete the history file along with previous MOT certificates, maintenance invoices and BMW service check sheets. 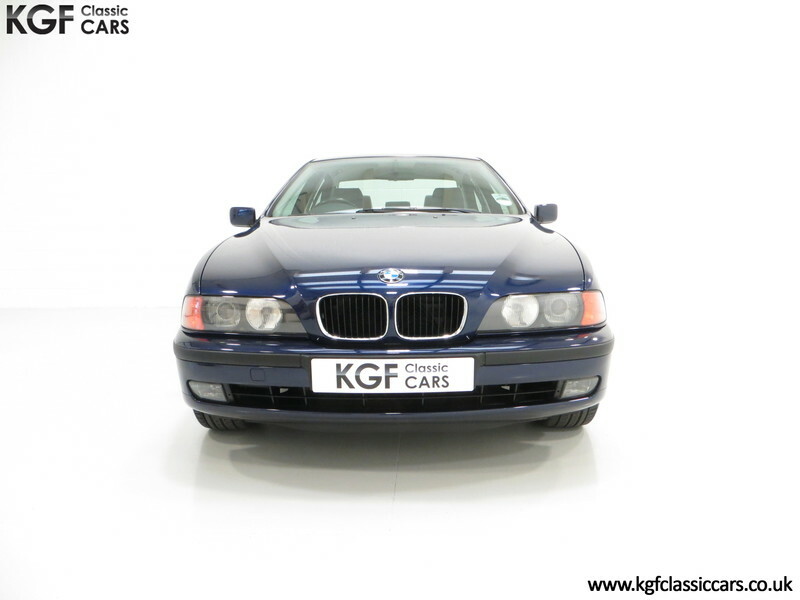 To drive a low mileage and cosseted E39 BMW is a true motoring delight, with the manufacturer’s claim of creating the Ultimate Driving Machine clearly justified.